La Esperanza is a well known fashion brand in Pakistan.you will always fine awesome collection from La Esperanza. The main product lines of La Esperanza are casual wear, formal wear, semi-formal wear, party wear.Right now La Esperanza bring summer spring collection for women and girls which include unique and stunning fashion and stylish dress.La Esperanza collection also include long shirts with trousers and churidar pajamas.La Esperanza collection include party wear and causal wear.lets have a look of this latest collection. 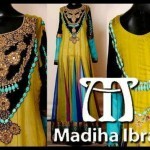 This entry was posted in Dresses and tagged 2013, Churidar Pajamas, Formal Wear, La Esperanza, La Esperanza Summer Outfits, Long Shirts, Party Wear, Semi-Formal Wear, Summer Collection, Trousers, Women Casual Wear by Style Cry. Bookmark the permalink.